Baby or Child Winona Camo© ~ Ridge Runner Hat. Baby and Child size Camouflage Ridge Runner or News boy style hats have been added to The Knit Tree's line of Camouflage knit caps. 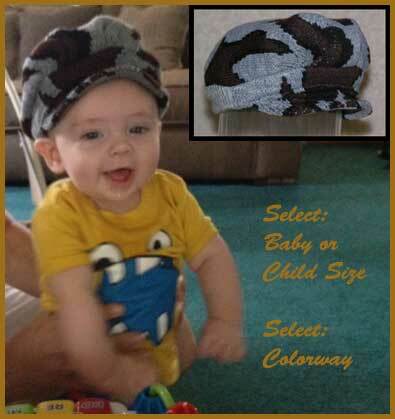 See Baby Ryker enjoying his camo news boy Ridge Runner hat in color way S: Grey Black Brown. You can order yours in any of the available colors: see Options below. The Baby and Child ridge runner hats are styled just like the adult Winona Camo© ~ Ridge Runner Hat Originated by Bob Fratzke. The back trim is a 1 x 1 rib with lycra so it will stretch for the head size. The front has a soft bill proportionate to the size. The baby and child size hats are offered in the acrylic fiber so the weight is lighter and drapey for the little heads. Now, the whole family can be in Ridge Runner Camo Style. 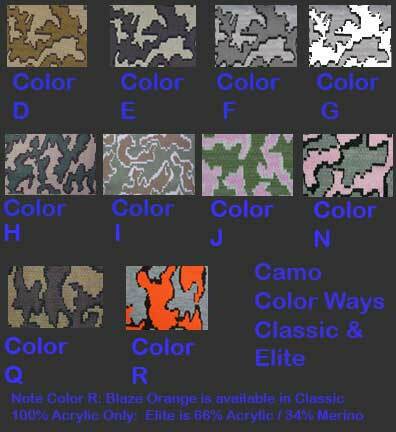 there are 3 choices for the Back Rib Trim color for each colorway:Color 1 is the first color listed in the camo color way Grey in our Sample, Color 2 is the 2nd color listed in our Camo color way - the smaller Shadow color: Black in our Sample, or Color 3: the third color listed in each Camo color way, brown in our Sample.